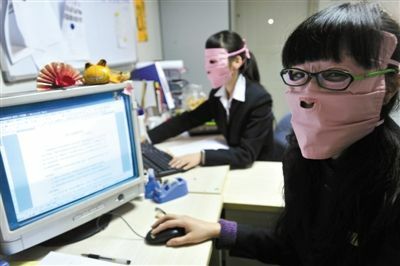 On February 22nd, 2009, two employees of Wuhan Luxiang Plaza Company 1 wore anti-radiation masks and protective glasses to prevent computer radiation. Photographic information Zhou Chao Industry Association denies radiation suits gathering radiation CCTV has reported on radiation suits or increased radiation; China has not yet introduced relevant industry standards Recent survey programs broadcast by CCTV show that radiation protection clothing or make the radiation intensity in clothes become larger As a result, this investigation immediately triggered many disputes. The Shanghai Anti-electromagnetic Radiation Association held a media briefing with a number of experts in the field of radiation protection yesterday, saying that electromagnetic radiation shielding is effective for shielding electromagnetic waves and cannot be used as a collector of electromagnetic waves. CCTV once claimed that radiation protection suits only some of the radiation effective CCTV had previously reported that radiation protection suits have an effect on radiation from a single source, but not only did radiation from certain directions not play a protective role, but will allow radiation protection clothing Radiation intensity increases. The reason is that if you wear a radiation suit, radiation will be injected from the bottom of the clothing, cuffs and all other cracks, but it can not be reflected out, but the radiation intensity increases effect on the human body. Experts say that radiation protection suits will not increase radiation intensity According to Li Guodong, an adviser to the National Electromagnetic Shielding Materials Standardization Technical Committee, wearing radiation protection suits will not increase the radiation intensity. The CCTV survey tester Chen Fengâ€™s experiment is not rigorous. Li Guodong explained that the electromagnetic radiation entering the radiation protection suit from the cuffs and other gaps is very small in itself, and the gap between the radiation protection suit worn on the body and the human body is small, and each reflection of energy in the clothes will be weakened and become Heat until the radiation disappears. This part of the heat is absorbed by the body, but it is harmless to the human body. At the same time, the reflection distance from the entrance to the disappearance of the radiation is 3-5 mm. Therefore, the edge of the radiation suit will disappear and it will not reach the human body's heart, central nervous system and other sensitive parts. There is no timetable for the release of national standards for radiation suits CCTV said in its program that since the radiation protection industry is an emerging industry, China has not yet introduced relevant industry standards and it is still in a blank state without supervision. According to Gu Hongyi, a member of the National Garment Standardization Technical Committee, she is currently responsible for researching and formulating national standards for the detection of radiation suits. Gu Hongxuan said that the standard is being drafted and relevant departments have not yet quantified the relevant data and indicators. It is not yet clear when the specific release date. Linked radiation does not exceed the standard is almost harmless to the human body CCTV survey results show that the daily electromagnetic environment, most of the radiation level to meet the standard requirements, is harmless to the human body. In response, Liu Wenkui, a professor at Shanxi Medical University and an expert on the biological effects and protection of environmental electromagnetic fields, said yesterday that if electromagnetic radiation is excessively harmful to the human body in its environment, it is harmless if it does not exceed the standard. General formal manufacturers of electrical appliances, electronic equipment are tested before passing the factory does not exceed the standard, but do not rule out exceptions.